A understanding of wave polarization in VSAT is essential. Firstly, if we don’t transmit a polarized wave, we will waste signal power. That would make the satellite link inefficient, reduce its capacity and increase cost. Secondly, we can use both polarizations at the same time to transmit independent signals. This can double the capacity of satellite. From a technical perspective, linear polarization is defined as polarization of an electromagnetic wave in which the electric vector at a fixed point in space remains pointing in a fixed direction, although varying in magnitude. There are two forms of linear polarization: vertical, where the electric field is perpendicular to the Earth’s surface, and horizontal, where the electric field is parallel to the Earth’s surface. Both directions can be used simultaneously on the same frequency. Some customers consider linear polarization to be superior, if only because the specific equipment costs are marginally less. Linear polarization can be found in both C-Band and Ku-Band. For simple signal polarization, all electromagnetic waves vary in three dimensions. Those dimensions are Frequency, Phase, and Amplitude. One type of waveform, regardless of polarization type, will exist using the same given frequency. With frequency fixed, the focus when examining the waveform is then on phase and amplitude, the other two dimensions. If the phase is found to be identical, meaning the Horizontal (H) and Vertical (V) components are in phase, this is the definition of Linear Polarization. The relative amplitude then (the remaining dimension) determines if the waveform is considered horizontally or vertically polarized. Linear polarization is comprised of both Horizontal and Vertical components, which are exactly “in phase”, and have exactly the same frequency as stated above. This means there is always a component in both the horizontal and the vertical plane for each frequency in the spectrum. How we tune or extract the energy from the wave establishes the operational mode. The polarization setting (direction or degree value) is related to how the two signals vary in amplitude in relation to the other. Some customers feel that circular polarization is not as desirable as linear polarization. The reasons for this view are not clear; one possible reason is due to the customer not being fully educated on the benefits or the price sensitivity towards equipment. However, it is important to realize that the increased reliability in signal strength, resistance to weather conditions, and ease of installation outweigh the expense of the feed horn. Technically speaking, circular polarization involves the plane of polarization rotating in a corkscrew pattern, making one complete revolution during each wavelength. The circularly polarized wave will radiate energy in the horizontal and vertical plane, as well as every plane in between. 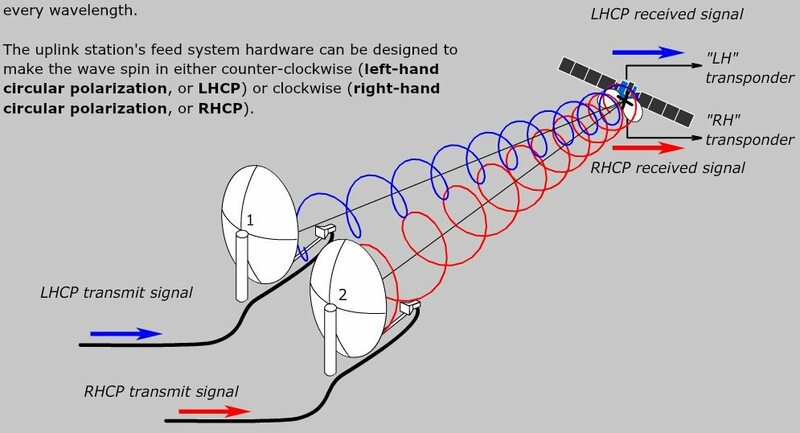 There are two directions of propagation that come with circular polarization: Right-Hand-Circular (RHC) which follows a clockwise pattern, and Left-Hand-Circular (LHC) which follows a counterclockwise pattern. As with linear polarization, both directions can be used simultaneously on the same frequency, allowing higher revenue generation through the doubling of capacity on the satellites. Circular polarization can be found on both C-Band and Ku-Band. It is important to note that Intelsat does not have any Ku-Band fleet with circular polarization. Circular Polarization. Circular, as well as elliptical polarization is possible because the propagating electric and magnetic field can have two orthogonal components with independent amplitudes and phases and the same frequency. For Circular polarization, both Frequency and Amplitude are equal, so only their Phase relationship determines the polarization type. The direct relationship between the phases — which one is ahead of, or leading the other — determines the direction of rotation. Circular polarization doesn’t require tuning or nulling out the opposite polarization component as is required for Linear. The polarization is fixed as either right-hand or left-hand circular and the proper type of feed is selected and installed; no further adjustment is needed. Circular polarization predominates with C-Band networks. Circular polarization operates in more of a helical type arrangement where you can have two types of circular polarized signals. Looking at a transmission from the remote towards the antenna feed horn in the direction of transmitting towards the satellite, right-hand circular polarized signals would rotate clockwise and left-hand circular polarized signals would rotate counter clockwise. Circular polarization also helps reduce the amount of rain fade in the 12 Ghz range of transmissions. Polarization is the orientation of radio waves as they leave a transmitting antenna. This is true across the entire RF spectrum, of which VSAT frequencies only occupy a small segment. Common polarization types within the VSAT segment include linear and circular. Receive antennas must be oriented on the same plane as the transmitted signal. Linear polarization is either horizontal and vertical. It might be easier to think “sideways” or “up and down”. In horizontal, the radiation pattern comes sideways off the transmit antenna. In vertical, it comes off up and down. These waves maintain that relationship to the transmit antenna as far as they can travel, and the receiving antenna must be oriented on the same plane; horizontal transmitter to horizontal receiver, vertical transmitter to vertical receiver. Circular polarization is either left hand or right hand. It might be easier to think of a corkscrew spiral. In left hand, the radiation pattern comes spiraling off the transmit antenna in a left hand spiral. In right hand, it’s the opposite. Again, the receiving antenna must be oriented on the same plane; left hand transmitter to left hand receiver, right hand to right hand receiver. To understand this in VSAT, you have to consider that the “dish” is not the antenna. It’s simply a reflector; focusing the RF plane on the transmit, collecting the RF plane on the receive. The actual antennas are tiny little dipole antennas in the waveguide. In most cases these miniature antennas are situated at the point where the waveguide attaches; BUC output, and LNB input. It is the orientation of these little antennae that determines horizontal or vertical. In circular, an additional device called a polarizer is added to change from linear to right hand or left hand. There are several key advantages for circular polarization over linear polarization, which make it more appealing to atmospheric conditions. These conditions can cause changes in the rotation of the signal, and will more adversely affect linear polarization than circular polarization. The effect of a high frequency signal passing through rain can cause signal attenuation and accounts for the majority of the problems with rain fade. Moisture laden clouds are also a factor; by the time a signal passes through a cloud system it can be attenuated by as much as 1dB. Water droplets on the feed horn may also cause detrimental effects. However, the most important aspect to note is that higher frequencies (like Ku-Band) degrade faster, harder, and longer than their frequency counterparts (C-Band). The only requirement is ensuring that the antenna is aimed in the correct direction on the satellite; simply point and transmit. This allows for circular feeds to be set up quicker, and there is less of a risk of being misaligned. There is higher link reliability since there is a low risk of misalignment, and encountering interference. Faraday’s effect will not affect transmission with circular C-band, so there will be no need to readjust the alignment. Finally, because transmission is sent and/or received at different frequencies, interference (cross polarization) is less of a concern.